Before this Blog gets fully under way, I thought you all should meet the kids. Greyhound kids, thats all we have. Since 1999 we have been blessed with 20 little feet scampering though the house, and hogging the couch, mostly the latter. Our current two are Roodie and Ella; half-siblings. They are so completely different that it makes us laugh. Ella's pretty much a truckdriver/tank hybrid who barks like a Rotti and bascially has no manners - she barks at EVERYTHING. She's a bit of a brute and sometimes smells funky. She also wants a kitty for Christmas. We call her Smella or Nut-Ellla. Nut-Ella makes us laugh because she's so goofy, she a D-O-G.
Frightz - Mamma nose best! 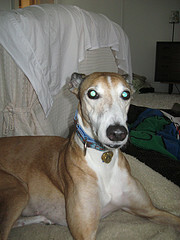 Ward was our second greyhound and he was sick and underweight when we adopted him from a wonderful group in Ohio. They rescued him from a not so good situation, God bless them. In short, he was a wonderfully loving guy who was medically challenged his entire 3 years with us. We called him our little Frankendog because he was covered in scars from head to toe, well, almost all his toes, all 8.5 of them. He must have had a rough go it before coming to live with us. When he went to the bridge my heart was never the same (this is still hard to write without tearing up). Ah Walter, he was a legend and loved by all. A LOT of people knew Walter. He was the kind of greyhound that had peeps and a dogtourage. I was just Walter's Mom. Walter came to work with me every day for 14 months, however, the highlight of his day was returning home to his Dad, what a guy. He and his Dad (my DH David) were two peas on a pod. They did everything together (when he wasn't forced to go to work with me - oh the dread). They definitely broke the mold after Walter was created. DH and I were crushed when he left us for the bridge but we were blessed to have had him in our lives for almost 10 years. Hi Maggie, thank you for thinking our pups are handsome but I suspect you are somewhat bias, no? Scalloped Potatoes in just under 20 Minutes! Bucket List – do you have one? I am an artist by trade now working in the field of accounting. I live in rural Ontario where I spend my spare time creating, cooking and designing stuff. Life is good.